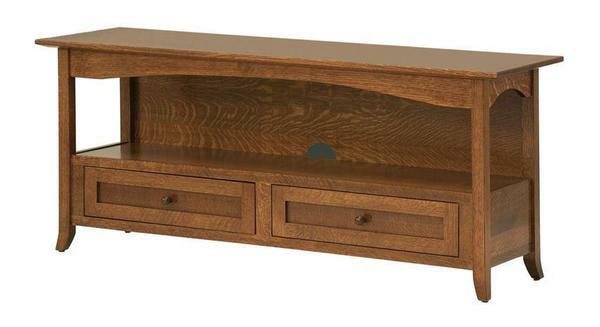 Our Amish Geneva Open TV Stand with Two Drawers features a clean, Shaker-style design that puts the emphasis on your flat screen TV and electronics. This solid wood flat screen TV stand includes a 1-inch thick top, open body, base with two inset soft-close drawers with dovetailed maple drawer boxes, tapered feet, and gently arching apron. Shown in quarter sawn white oak with #9 hardware, customize it to match your home by selecting the hardware, wood type, and finish from a variety of options.